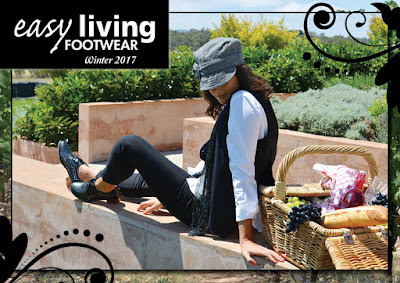 Easy Living Footwear NEWS: Our Winter Collection is here!! Our Winter Collection is here!! March is here already – it only seems like yesterday that is was Christmas and now the mornings are getting darker and the leaves are beginning to change colour. I have great pleasure in presenting you with our Autumn/Winter range which is full of your favourite brands and new season styles. As always, there is far more in store! 2016 was a year of reflection both for myself and the company as a whole. We saw the closure of our Orange store, the opening of Junction Fair, and in February we closed our Wagga store. I was very sad to close the 2 stores, but after many hours of deliberation, I felt it was time that I tried to “get a life”. Since our first Easy Living store opened 16 years ago, the company has grown and diversified with the market, but it was time to downsize and work more closely with my staff and customers. I have been very lucky over the years to have such a dedicated team, and without them Easy Living would not be what it is today. They are so passionate about providing you with exceptional service and a great experience, and for this I am truly proud and thankful to every one of them. You are also a huge part of why we have been successful. When working on the floor in our stores, I am always amazed at the loyalty you have given us. My goal now is to be able to provide you with a collection of shoes that you will not only love wearing, but will turn heads in the crowd. We are all ageing, but trust me - we are going to do it in style! I hope you enjoy our latest collection. Please call in and see the girls, save some money by using your voucher, and above all – enjoy life!! * Not all styles featured online are available in every store. Call your nearest store to confirm availability. Winter sees a huge colour trend in tan, navy and grey. Lace-ups and trendy flats are a big hit this season, with heels both small and high taking position aswell! Textures and patterns, buckles and external zippers also feature heavily this season, and short boots are definitely the go-to item for the wardrobe!! Again, we have another surge in the ath-leisure wear, with lots of colour and super comfort to go with it - it's definitely a colourful Winter ahead!! NEW SEASON CATALOGUES ARE ON THEIR WAY!! Due to the increasing postage costs of Australia Post, we've had to unfortunately cut back on our catalogue distribution. Our active customers who purchased within the last 6 months (who met the minimum spend level) will receive catalogues, which have just started to hit mail boxes today! For those who missed out, we're happy to send a catalogue your way - just email amy@easylivingfootwear.com.au with your details! We are currently in the process of a redevelopment of our Webstore - if you have problems placing your order, you're welcome to do Mail Order over the phone! Just give us a call on 02 6332 3822 (select #3 - Online option). TO CELEBRATE THE LAUNCH OF OUR NEW SEASON! !